Couture: McGregor, White Are Manipulating Malignaggi Situation! MMA legend and former two weight UFC champion Randy Couture is questioning the intentions and motivation of Conor McGregor to retain Paulie Malignaggi as a sparring partner. Malignaggi, a former two division champion, was hired by McGregor to help the UFC star prepare for the upcoming showdown with Floyd Mayweather Jr. on August 26th at the T-Mobile Arena in Las Vegas. 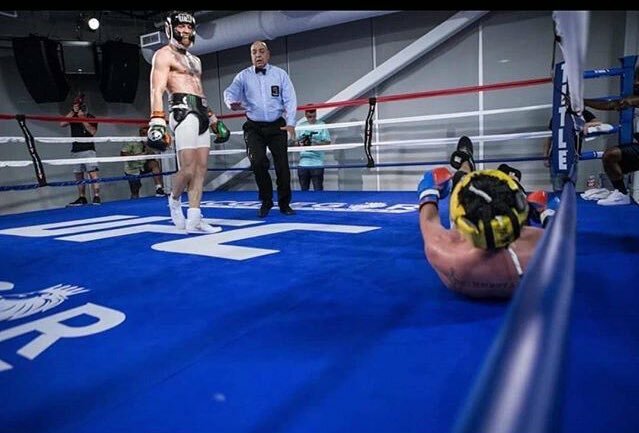 By their second sparring session, numerous photos were leaked by McGregor's team members, which create the image that Malignaggi took a bad beating and was knocked down to the mat. Malignaggi became enraged after the photos surfaced and immediately quit McGregor's camp. Malignaggi claimed that he was shoved down by McGregor and also claimed that he gave as good as he got in the sparring sessions. The situation escalated even further last Friday, when UFC President Dana White released video clips on social media - which show several angles of Malignaggi going down and a clip of McGregor landing hard punches. Malignaggi dared them to release the entire sparring video. Couture is also demanding to see the entire sparring session. "Let's see the other eleven rounds that they sparred. Where did that footage go? What did that look like? We see the one round where Malignaggi may have been off-balance [and went down] and Malignaggi is treating it like sparring," Couture told Undisputed on Fox Sports. "Sparring is different than fighting. McGregor is acting like he was in the main event on fight night. It's still sparring in a practice gym and lets see the other footage. I think they are manipulating the situation. "Usually sparring is something done over weeks. The fact that this was a one time event is questionable to me. I have my sparring partners replicate my opponent and they stay for the entire camp and they know what they are there, to help me prepare and solve the problem of the guy across the ring from me. This has a lot of questions around it." "I agree that [Malignaggi] is a skilled boxer, but he's been retired and he's a long way out of that. Again, I think it's a manipulation. Where are the other rounds? If you're going to show me that one little piece, where Conor had a good moment..... I'm sure there were other disputed moments, but Paulie didn't have a guy there filming the whole thing, so those [moments] are not going to be released. [Having a camera crew and photographers] there is not normal, which is what calls this whole thing into question."